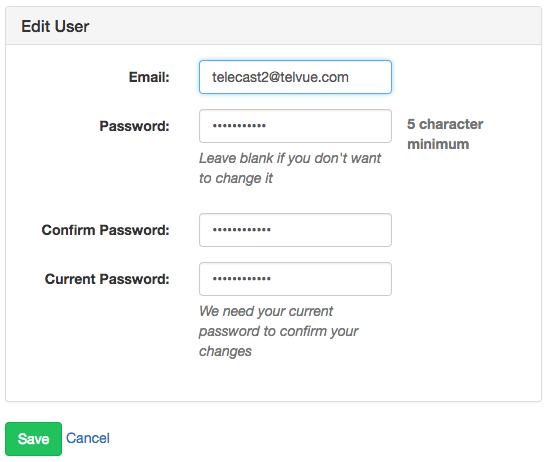 To login to the TelVue TeleCast 2 encoder Web User Interface, enter the URL http://<ip_address> in a web browser from your PC, Laptop, Tablet, or Phone, where <ip_address> is the IP Address of your encoder. For example, if the IP Address of your encoder is 192.168.1.100, the URL would be http://192.168.1.100. See the Networking section for how to setup the IP Address. Enter your Username and Password and click the Log in button to login. Optionally check the Remember me check box on to have your browser remember your login credentials for subsequent logins. The default Username is admin and the default Password is admin. Once logged in, you will be taken to the Dashboard page. 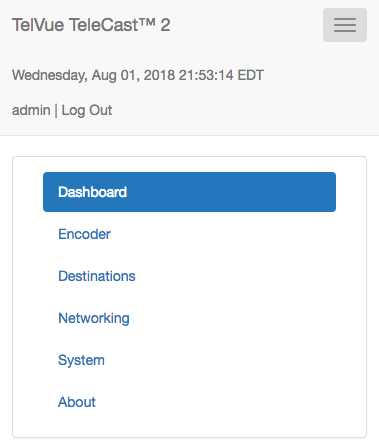 The top of every page displays the application header that includes the current date and time (based on the configured Time Zone per the System page), the Username of the logged in user, and the Log Out link. The mobile layout will also include the “hamburger” menu icon to toggle displaying the application menu options. Click the Log Out link to log out of the User Interface. Click the logged in user Username (admin) to edit the user settings including changing the login password. Email: Enter an email address for the user. Password: Enter the new login password. The password must be a minimum of 5 characters. Leave blank if you don’t want to change the current password. Confirm Password: Re-enter the same, new login password as the Password field above as a safeguard to ensure you are entering the desired password correctly. Current Password: Enter the current password to confirm your changes. If you have not changed from the default, the default password is admin. Each page in full screen layout includes the application menu on the left of the page. The application header for each page in the mobile layout includes the “hamburger” toggle to display the application menu. 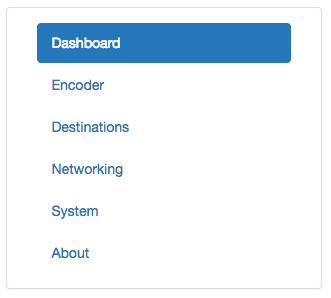 Dashboard: Status, quick access to start/stop streaming per destination, confidence monitor. Encoder: Configure video and audio encoding parameters. Destinations: Configure one or more streaming destination. Networking: Configure networking including hostname, DNS, NICs. System: Configure NTP, Time Zone, and actions to Restart, Reboot, Shutdown the encoder. About: Serial number, software versions, and hardware information. Throughout the Web User Interface, most of the settings include a help icon that can be clicked for more information about that particular setting.